effect of a variation between two test emails, web pages, landing pages, web forms, and more. The change in impact is measured in parameters such as open rates or click-through rates, form submissions, etc.. Marketers test one variation against another (hence “A/B testing”) and track the metrics that prove the effectiveness of each option. The “winner” is then tested against the next option and so forth. And you keep testing to see which of the improvements affect user behavior for the better. While the cost of acquiring new app users is enormous, converting your existing users into paying customers is much easier and more cost-effective. And often, the simplest of changes in user experience within your app can affect your conversion rates. Split testing then allows you to optimize individual elements of the user experience, ideally leading the user down the funnel toward a purchase. Use split testing to compare several versions of the same call to action, different versions of a user interface, or variations in app messaging. There are many more factors you can experiment with using this method. 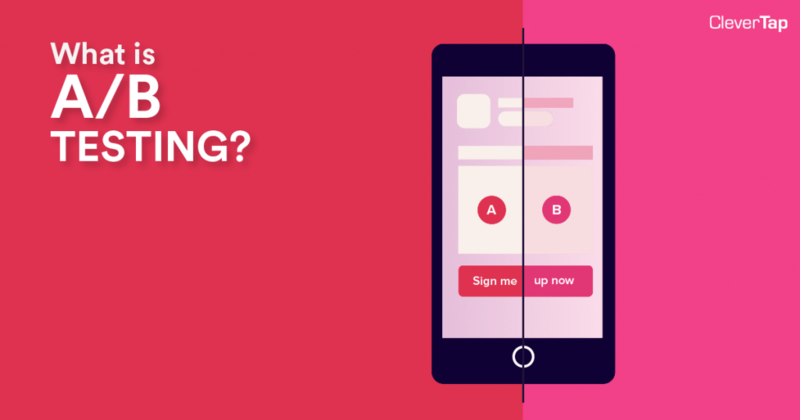 A/B testing plays an enormous role, not just in the design and aesthetics of your app but also in crafting a delightful user experience. Test based on solid hypotheses, track the numbers correctly using good tools, and don’t be surprised if the experiments give you unexpected results. There’s just one thing to remember: don’t get carried away and test so many factors that it impedes your ability to actually ship out your app or its updates. Don’t use split testing as a way to stall decision making in your development process! Now if you’re set on conducting your own A/B testing experiment, and need to calculate the ideal sample size for each variant, then head on over to our Advanced A/B Testing Calculator.